Why do Korean people stay so long at buffets? Do you think we'll ever be like Caucasians and not try to maximize each dollar spent? Why is this? The reason why John's question is fascinating is because they involve two fascinating social phenomena -- one is the "immigrant time warp," and the other is the "cultural capital and consumption". The Korean already touched upon the immigrant time warp in this post. To summarize: "immigrant time warp" is a phenomenon in which immigrants tend to preserve their modes of thought and behavior of the country at the time when they emigrated. For example, suppose a Korean adult emigrated to the U.S. in the 1970s. That Korean adult, for the rest of her life, will think and behave more or less like Koreans of the 1970s. This is because she only receives a tiny trickle of American modes of thought, as she is facing language barrier and does not fully interact with mainstream Americans on a consistent basis. But more significantly, she will be cut off from the changes in modes of thoughts and behavior of Koreans back in Korea, because she is geographically away from the changes in Korean society that cause Koreans back in Korea to re-examine and change their modes of thought and behavior. It is as if she is caught in a time warp -- she becomes a walking time capsule of the value systems of Korea in the 1970s. So here is the first point -- when one sees a Korean American who takes his sweet time at a buffet, the Korean will bet heavily that the particular Korean American is an immigrant prior to mid-1990s. And the Korean can personally testify that this was true: Koreans absolutely destroyed any buffet offered to them, and the trend only ended around mid-1990s. The most stunning visual evidence to this is the infamous salad towers. It is right now prevalent in China, and here is a great picture of one. 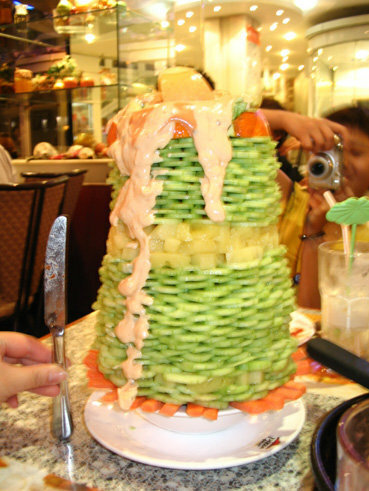 Salad tower from Pizza Hut in China. Exact same thing used to happen in Pizza Huts in Korea. Because Koreans used to stay and milk the buffet salad bar, Pizza Huts in Korea used to limit the trip to salad bar to one time. But when the rules get in the way of what people want, human ingenuity can always find a way -- the result is a salad tower. The Korean used to be very good at this also, when he was a strapping young buck who would eat nine full meals a day with snacks in between. His salad tower height record was probably about two feet. But the mystery still remains: what is it about Koreans of their era (and contemporary Chinese) that compels them to stay long at buffet? This question becomes even more mysterious when one recalls that the answer is not "poverty" -- Koreans did not lack for food by 1980s, and contemporary Chinese (or at least, those Chinese who can afford to eat at Pizza Hut in large cities,) do not lack for food either. This is where the second theory, cultural capital and consumption, comes in. A quick definition first. "Cultural capital" is a concept coined by Pierre Bourdieu in 1984. While Bourdieu uses a lot of big words to explain this concept (as philosophers tend to do,) the core idea behind it is simple: it is just the amount of "culture" one has, be it knowledge about music, manners and dispositions, overall education, etc. As applied to consumption, people with high cultural capital generally consume goods in a different manner from people with low cultural capital. DAVID (LCC): Well, generally when I go out to eat, I'm sitting there thinking, "If I was at home I could fix this, a bigger portion for a whole lot less money than what I'm paying here." It destroys the whole thing, because I'm thinking so much about how much ... they're making a bloody fortune off me for, you know ... where a buffet, you know, I'm in the driver's seat kind of you know. I know up front how much it's going to cost me and I can eat as much as I want. I go away hungry it's my fault, you know. KATE (LCC): Of late, we've been going over to Milroy for seafood. Every Friday night they have a buffet ... They have crab legs, shrimp, all kinds of fish deep fried, with clams that are deep fried. Along with ham, chicken, beef. You have your beverage and delicious homemade dessert and soft ice cream for $6.95 ... I wish you could see people eat those crab legs. They bring them out on trays and the minute they bring them to the salad bar, everyone rushes to get them. RUTH (LCC): At the Hotel Edison -- it's a family-style that has chicken, turkey, or ham that you can pick; there's filling, and there's lettuce with that, Jell-O salad, dessert, and coffee, all for like $10, you get all this food, as much as you want, they keep bringing it out, plus waffles. That's why it's his favorite thing to eat is to go there and have waffles. Change "chicken" to "kimchi" and David, Kate and Ruth might as well be all Koreans. And here is the crucial consideration: up to around late 1980s, entire Korea may have been fairly characterized as an LCC country. Consider the childhood years of Koreans who were in their 30s through 50s (i.e. those people who dictate the dynamics of a society) in the 1980s. Their childhood had two major wars -- World War II and Korean War -- looming in the background. Everyone was desperately poor. 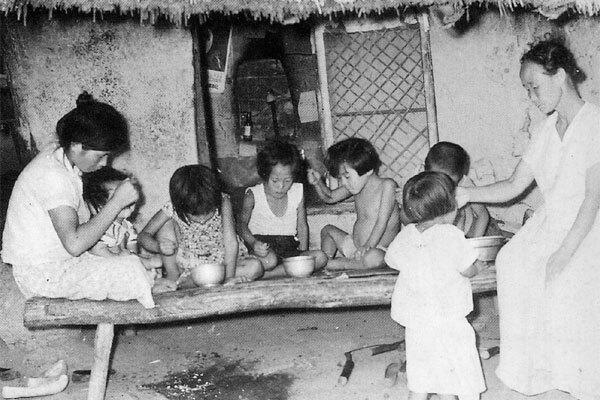 Starvation was not only a real possibility, but also a frequent occurrence for many Koreans all the way until mid 1970s. Recall that a proper Korean table involves a bowl of rice, soup, and several side dishes. which likely means the parents had nothing else to serve. These children became adults in the 1980s. Think about that. Because few Americans have been genuinely hungry growing up, few people in America understand this: when you grew up starving, eating a lot becomes an obsession. This also contributed toward the strange trends in Korea's culinary fads dominated by different kinds of expensive protein (galbi or gwang'eo-hoe, for example) instead of cheap and healthy meals. Especially in the 1980s, the rate of heartburn and other gastrointestinal diseases among Korean adults was through the roof. As Korea is settling into its current condition, things will change. In fact, things did change in Korea for the most part, as people began to focus more on overall health represented by the meals. But older Korean Americans, preserving their values in the immigrant time warp, will probably build a salad tower whenever they can. I think there is a similar dynamic to those who grew up in the Great Depression in America. My mother tends to can vegetables, freeze fruit, and conserve whenever possible. Not because she grew up during the Depression, but because her mother did. Hello, Chinese buffets anyone? It's not Koreans I see in these restaurants consuming more calories in one sitting than I eat all day long. The amount of food waste in school cafeterias is painful to witness. USDA regulations require cafeteria workers to put all food items on the plate to meet nutritional guidelines, even if the kid doesn't like the food and won't eat it. Exceptions are made only for allergies. PB&J sandwiches are a daily entree alternative and a popular choice with my students. To meet nutritional guidelines, a slice of cheese is placed on top of the sandwich. Of course, the kids don't eat it, and most of the slices end up in the trash along with half-eaten fruit that is too large for a child to consume as part of a lunch. As a midwesterner inducted into the Clean Plate Club as a kid, I cannot stand to see food wasted. I think I know what you mean... My dad was raised in a piss poor village in China. He ended up being a tight wad for the rest of his life even when he made mega money. Mega money he made off my back. Curiously I've turned into a tightwad too from far too many days living as a student bum. However you guys are amatuers! I mean FFS salad? Salad? SALAD! TCG does this in fake Chinese and Indian buffets in Manchester, but using MEAT. Koreans don't seem to mind TCG and his German wingman either as we ate in Sokcho towers and towers of meat and completely emptied the Kimichi pot and kept going back for more. Yet the Korean lady running the shop didn't seem to mind. While when we went on to Beijing they did not count on two weary world travellers who had been on the road for half a year and we were booted out. I always hated buffets in America because of the ridiculous amounts of food everyone ate at them (especially my parents). My family has gone through a "young married with kids poor phase" in every generation (including myself, although I am substantially better off than my parents were at my age), and I'd agree that being a student bum has made me pretty much unable to pass up free food in the break room (even though my bathroom scale keeps telling me to stop). My amazement comes from watching extremely thin people eat enormous amounts of buffet food, seemingly unscathed, whereas I just feel guilty for going to a buffet. I have never gone hungry in my life, my parents always provided for me and my siblings foodwise, bless them. However, (I am Korean/American) everytime we went in a buffet, even at a young age there was always the intent of "maximizing our dollars" ie. starving ourselves beforehand and staying as long as possible. It seemed to me like common sense, I don't think I understood why anyone would not go in there with that intent. One fellow korean/american friend whom I know never had to worry about starvation, during his college years, would walk into an Old Country Buffet for breakfast, sit and study for a couple hours then eat lunch, study some more and eat dinner! From my experience it has absolutely nothing to do with a fear of starvation, but the simple satisfaction of getting as much as possible out of "all you can eat", it is almost like a challenge in my mind when those words are printed. hm funny in our case it's totally the reverse. I'm always getting mad about my Korean love, when he throws out food, like: "why don't you think about your North Korean brothers?" and he keeps telling me other times that: "Don't eat it, you gonna be sick, don't eat more, stop it". I learned some of my eating habits from my parents who were children during the great depression. Even if we did have plenty of food growing up, there was definitely a mentality that everything should be tasted at the buffet. We even tried the soup, although we rarely had soup with a big dinner at home. My great aunts would stuff their purses with rolls. Perhaps the Koreans are getting an unfair rap, since I see people of every ethnic origin pile their plates much higher at buffets than would be on a normal dinner plate. I would venture to say that hanging out a longer time there may have something to do with the culture of eating and socializing together. Maybe there is a Korean habit of chatting and nibbling until the food trays are put away by the host to hint it is time to go home? I've been told that this is also the reason why Korean pizzas are loaded with so many and so random toppings. Yep - my Korean mother's version of this is always getting extra salad and breadsticks at Olive Garden. She takes the unlimited salad and breadsticks thing pretty seriously. I really hate wasting food too, having grown up under her influence. It really offends me to see how much food is wasted sometimes, knowing that even here in the US there is a lot of food insecurity (particularly now with the rotten economy). So, even though my mom's food-hoarding tendencies and restaurant behavior are an example of "low cultural capital," it also gives me some important perspective - I'm grateful to be able to live a relatively comfortable middle-class lifestyle, because I'm well-aware that not everyone is so lucky. Don't mock those salad towers. Those were feats of engineering. Reminds me of Margaret Cho's bit when she imitates her mom: My "idea of heaven is a big buffet where you never get full and you never get fat, aaahh!" Of course, buffet is pronounced "boo-pay." What you said also makes the Korean greeting "Have you eaten?" actually make more sense. Nobody really cares if you actually have eaten, and if you haven't the correct answer is always yes. It took me a while to get used to that, as I thought it was a strange question to ask, and whenever I answered it with a truthful no, I'd get strange looks from people. But you could be having a terrible day, and be totally stressed out with a zillion things to do, but someone will casually ask you what's up? and you'll reply "nothing much!" or "How are you doing?" and your answer will be "fine"
After reading the post AND the comments, I think I came to understand why people on internet say" My favorite 2 words: free+food" I always wondered what's up with this obsession for food, especially the free one... I obviously am not asian XD For me, loads of food in topped plates means loads of numbers on your bathroom scale... idk.. I do not understand, living in an essentially Korean town here in Los Angeles, how then the Koreans are so slim? If they eat so much buffets??? Maybe Koreans are slim because they avoid buffets. I certainly do because while I like to think of myself of a HCC, I eat like a LCC. I cannot eat a reasonable amount of food at a buffet. But I was in a Chinese restaurant in Toronto that had a buffet - I wasn't that hungry so ordered a la carte. I asked the waiter (temporary worker from China) what the portions were like and he said they were small. When the plates arrived, they were huge! When I asked the waiter why he told us the portions were small, he said it was because of how much food Canadians ate ... and I noticed how a lot of people had tons of food on their plate and then an extra "meat" plate in their other hand.